I wrote the following article for the April Fool’s edition of the Occidental Weekly, which, unfortunately, isn’t available online. However, if you are around Occidental be sure to pick up a copy — the entire thing is hilarious. The Apple iPad comes out this Saturday, April 3, and I am bringing you the world’s first review of the device. No, I haven’t used it yet – nobody has. It doesn’t matter, you should go and buy one right now (or go start forming the line down at the Apple store). It’s a magical device! Apple says so. There aren’t any other gadgets out there that let you perform actual supernatural feats. Any old PC can let you read your email, but only the iPad lets you read your friends’ internal monologues (in 3D). 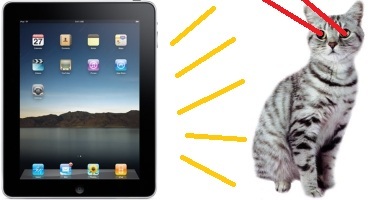 And while I can create a classic lolcats image using Photoshop on any desktop, the iPad can summon a real, talking lolcat (or laser cat) that keeps getting itself into adorable situations. Those are just examples. The iPad still does all the things that the iPhone can do, like find your precise location in Google Maps (as long as you’re not in China… then Google has NO IDEA where you are), or watch a cat play the keyboard on YouTube. And, as always, “there’s an app for that”. The iPad has access to thousands of applications. This includes apps that can make it look like you’re drinking a keg of beer, send you back in time to 1986, tap for mana of any color, and let you pass through the barrier onto Platform 9 and ¾. Now, the iPad isn’t perfect. Sometimes, seemingly at random, it will crash and give you an error message, stating, “You have displeased the iPad.” Currently, the only fix is to coddle the device for a while, whispering lullabies to it. These minor flaws are no reason to not run out and pick up an iPad right now. What are you waiting for? Go. It’s not too late to for you to be that one guy who camps outside the store overnight for no discernable reason.